Jordan Auto Body, is environmentally conscience about the damage automotive paint can do to further erode our environment. Because of our environmental concerns, we have partnered with a company called Lesonal. Lesonal is one of the leading environmentally safe paint systems in the marketplace today. Jordan Auto Body uses only paint developed and created by Lesonal. Don’t be fooled into thinking that you are going to get your bumper, door or hood painted for $129.00 or some other special of the day. Cheap or low cost paint jobs generally deliver what you pay for. Jordan Auto Body explorers every possible option to get your hood, doors, front bumper and rear bumper repaired, when applicable, and painted using our expert painters and expert body repair personnel. Our paint jobs (services) comes with a limited Lifetime Warranty that we backup in writing. 1. Do you charge extra for repairs, if necessary? 2. Do you remove the parts you are painting from my vehicle? 3. Do you offer a warranty on the paint job? If so, what is it? 4. Can you show me how your painting process works? 5. Under normal conditions, how long should this paint job last? If you can’t get satisfactory answers to these questions, get back in your car and go the other way. Remember, you will get what you pay for. Hail Damage – Hail damage can often time require a paint job after the repairs are completed. Ask for more info. 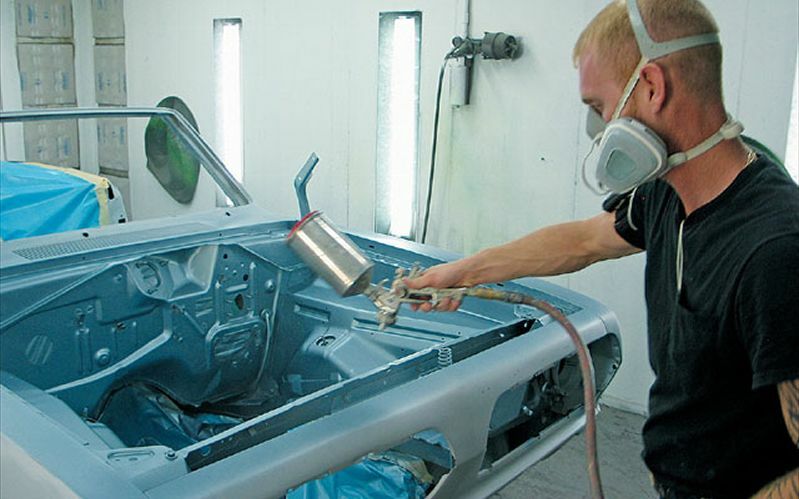 Auto Restoration – Automotive restoration will require a paint job. This paint job will be applied from the bare metal up to the clear coat. Auto / Car Scratches and Dents – Often times depending upon the depth and severity of the scratch, a paint job will be required. New Bumper – New bumpers generally are not painted. So a paint job would be required to match the paint to the color of your car. Bumper Repairs – If your bumper, front or back, can be repaired a paint job will be required to match the color of your car. Jordan Auto Body understands that with every investment there is some risk involved. Your automobile is one of those investments that is designed to get you and your family and friends to and from various locations. Each time you get in your car, park your car or drive your car, the risk of an accident increases. Although Chicago is full of automotive paint shops and mom-and-pop paint shops that offer you an array of paint options, Jordan Auto Body employes expert painters that understand your car’s paint job. Today’s paint jobs are complex and require expert knowledge of the new paint system employed by your car’s manufacturer. Jordan Auto Body understands the new paint system and that understanding allow Jordan Auto Body to get your color matched exactly as it came from the manufacturer. And we understand that there is some wear and tear on your car’s paint job, that may cause it to fade over time. Our experts can blend your car’s new paint, whether it’s a door, hood, fender, bumper or other parts to match exactly. So it doesn’t matter if you have a foreign or domestic vehicle, we can get the paint job done correctly, quickly, professionally and in a cost effective manner. Whether your car is a Cadillac, Ford or Chrysler, we can get the paint job done correctly. If you have a Mercedes, Porsche, BMW, Lexus or other foreign vehicle, we can get the paint job done correctly. Our expert painters are certified and retrained throughout the year to make sure they are current on any of the new systems employed by the automotive manufacturers. We stress this level of training and expect nothing but the best paint job for your vehicle. Jordan Auto Body has been in business, at the same location, for over 20 years. Check out some of our paint jobs on our website by clicking here. Those customers were not disappointed by the quality of the paint they received and neither will you. Call Jordan Auto Body to get your car’s paint job back to like-new condition. You want your car running good and looking good. And with this Chicago weather you need durability and a lifetime warranty on your paint job – Jordan Auto Body’s paint services gives you both. Contact us today at 773-395-8888 to set your appointment today – you won’t be disappointed. As a company that strives to provide the most efficient auto painting Chicago motorists need, we make sure to do our job well the first time so you can take your car home fast and without hassle. Painting your vehicle shouldn’t be one more thing you have to worry about and do on your free time. Whatever the color or design, we have the know-how to paint your car well and fast for you. Call us today!